Dewey Readmore Books was the famous cat from the Spencer Public Library, in Spencer, Iowa. Dewey used his cunning cat-like ways to unite a town, and just by being himself, attracted a legion of fans from all over the world. Dewey's story is an amazing one, and Dewey was, without a doubt, an amazing and very special cat. On a freezing morning in Iowa in January of 1988, Vicki Myron arrived at work to find a frost bitten orange kitten in the book return bin. Apparently, someone had stuffed him in the slot and left him there. That kitten would, over the next 19 years until his death, bring comfort, joy, and harmony to the library staff and patrons. In fact, as their beloved resident library cat, his influence would spread to the entire town of Spencer, and eventually the world. Dewey is a book by Vicki Myron that tells the whole story of Dewey Readmore Books. How Vicki found him on that cold day, how Dewey won her heart and the hearts of many, and how she eventually had to watch him take his last breath in her arms 19 years later. It also is a story of a bit of history, the transformation of people and a town, a story of hope, and is a must read for cat lovers everywhere. The contest is closed, but you can view photos at that link. If you're interested, Cat Lovers Only holds contests from time to time as well, and you can subscribe to be notified by email. You can imagine that a cat growing up in a library would encounter a lot of people. Perhaps, though, Dewey is one of the friendliest cats who ever lived. I had heard of Dewey before, but I never really realized just how famous he was. I never realized how many lives he was able to touch. As I read the book, I found myself almost wishing that I had made the trip like so many fans, and met Dewey in person. I also found myself reflecting on my relationships with my own cats and all the things they've taught me. I also reflected on how every cat is unique, and how an animal can truly transform your life. I'll never be the same for having known Priscilla, Teddie and Frankie. Vicki Myron and her library staff would never be the same either. Cats have a way of teaching, by demonstration, how to enjoy the simple, every day things in life. For nearly 20 years, from his penchant for catnip, to his need to attack a typewriter (he's "after the clacker thingies..."), to his enjoyment of taking a ride on the library book cart, Dewey imparted his teachings. A warm copy machine is a great place to sleep. Dewey mended tensions and brought the library staff closer together. The uninformed (or perhaps the misled?) will continue to believe that cats are aloof. 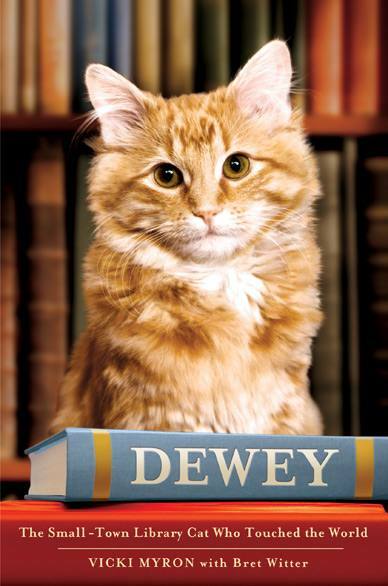 In true cat fashion, however, Dewey became the "ambassador of togetherness" for the library, and the town of Spencer. I have personally found that cats can have one, an amazing memory, and two, a sense of determination that outlasts even the most passionate human being with a cause. Case in point: Dewey loved rubber bands, and he loved to eat them. This was evidenced by the "rubber band worms" found in his litter box. Despite their attempt to hide them from him, Vicki and the library staff could not prevent Dewey from sneaking rubber bands. Humans forget. Not cats. Dewey remembered every drawer left open a crack, then came back that night to wiggle his way inside. He never messed up the contents of the drawer. The next morning, the rubber bands were simply gone. Is Your Cat Like Dewey Readmore Books? Does your cat do the Dewey Mambo over catnip? Do you hold your cat like a baby, or Dewey-style using the Dewey Carry? Does your cat look like Dewey? Variety reported in 2008 that Meryl Streep would star in a Dewey movie called Library Cat, but that project never completed.